INORI exhibition is held at the Japan Information Center Gallery in collaboration with a New York City based Japanese artist, Minako Yoshino(*) to honor the 2nd Anniversary of Japan's earthquake and tsunami on March 11th, 2011. This exhibition features Yoshino's Phoenix series of painting, calligraphy, kimono, and fan art, along with the documentary video and photographs of her marble sculpture series INORI. The original music, inspired by and specially composed for this exhibition by Makia Matsumura, will be playing during the viewing hours. Please come and share the precious moment of INORI, whatever your nationality and religion. * Meet the artist on Monday, March 11th, 2013. 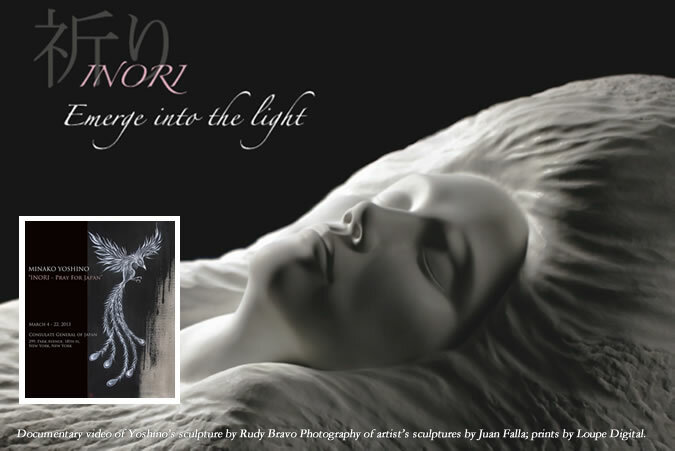 Please stop by and share the precious moment of INORI (No appointment needed). Any day except March 11th, 2013, please make an appointment at info@minakoyoshino.com or call 212-920-1143 to meet with the artist at the exhibition.